Instant Pot Creamy Chicken Tortilla Soup is a hearty, spicy tomato based chicken soup. A delicious quick easy dinner that you can throw together in a jiff, this is one of our favorite Hatch green chili recipes! I Think I’m the Last Person to Buy an Instant Pot. Talk about being the last to cross the finish line. After two years of being an Instant Pot lurker and watching the sweeping mania unfold, I finally added this electric pressure cooker to my culinary tool box. My curiosity finally got the best of me. I think the last straw was reading a New York Times Article written by Melissa Clark, and my intrigue led to the purchase. She’s also written a informative article How to Use an Instant Pot. And I even went out on a limb and bought one for my friend for Christmas. It’s been fabulous fun having someone to learn with, to share nervous jitters with and to share success with. We’ve become Instant Pot accountability partners. Why do I need an Instant pot? I’m retired and have all the time in the world to cook. I’m afraid. As in “kaboom” afraid. It will end up in the back of the closet, rarely used. Now, and just two weeks in, I’m starting to realize the Instant Pot as a true resource in my kitchen. We’re starting to develop a friendship. The one thing I know for sure is that there’s a learning curve. I just need to learn how to think like an Instant Pot. After thoroughly reading the user’s manual…after thoroughly reading a jillion articles…after thoroughly reading the instruction manual, I felt comfortable to complete the water test. I then advanced and made a batch of hard boiled eggs. Great result and easy peeling from super fresh eggs. Unheard of in my books. 1 point for the Instant Pot. Then graduated to real food. My first experiment was with a pork roast with adovada sauce. It worked fine, but not as rich and earthy as my oven/stove top method. Back to the drawing board on that one. 1 point for my Dutch oven. I tried to convert my Butternut Marsala Crock-pot Beef Stew recipe to an Instant Pot recipe and it just didn’t work. Too much liquid, too strong an alcohol taste and the butternut squash was mushy. Back to the drawing board on that one. 2 points for my Dutch Oven. Next up was my trusty Ranch Style Chicken Tortilla Soup. I’m so pleased to report it worked beautifully. I simply studied some recipes with similar ingredients, studied the methods from reliable sources and took the plunge. Cooking this creamy chicken tortilla soup in the Instant Pot delivers more flavor than my stove top version. And it’s so incredibly easy. With the added depth of flavor I’m giving the Instant Pot an extra point. It’s 3-2 with the Instant Pot winning. So Why Do I Like My Instant Pot? Actually I’m pretty sure I love it. And it may sound silly, but so far, my big win is that it’s saving me clean up time. I’m cooking every single day. My kitchen really gets a workout and it’s always a fight to keep my stainless steel cook top and black granite counters clean and shiny. The Instant Pot with its saute feature and one pot advantage really makes clean up a breeze. No elbow grease needed. Another point for the Instant Pot. The key for me is to find about a dozen recipes that work like a charm in the Instant Pot. Recipes that will be my Instant Pot go-to’s. I can’t wait to try BBQ ribs. Could the absence of an all afternoon slow roast in the oven be possible? I made this Instant Pot Ground Pork and Pasta recipe. My first stab at pasta in the pot. The texture of the pasta was beautiful, not to mention this recipe is fabulous in flavor. I’m impressed with pasta in the Instant Pot. Thanks Pam, great recipe. I’m making ham and bean soup tonight – without a 3 – 4 hour slow cook. What I’m not going to make is any recipe that takes the same amount of time or less without the Instant Pot. Like Sloppy Joes? I’d love to hear your thoughts about that one. Actually I’d love for you to comment with your favorite Instant Pot Recipes and a link. I’m dying to to try proven successful recipes. 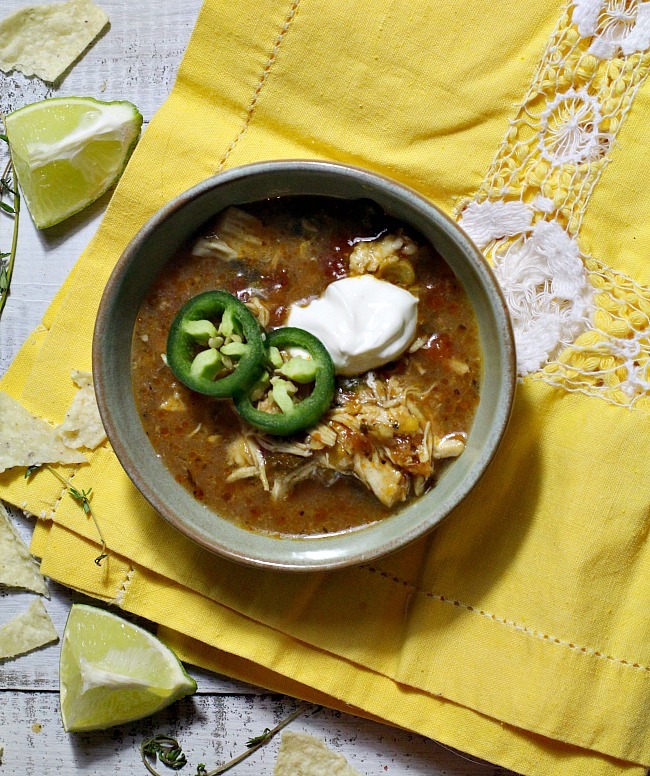 So enough about the Instant Pot, let’s talk about this Mexican chicken pressure cooker soup. There are a million Creamy Chicken Tortilla Soup Recipes – Why This One? 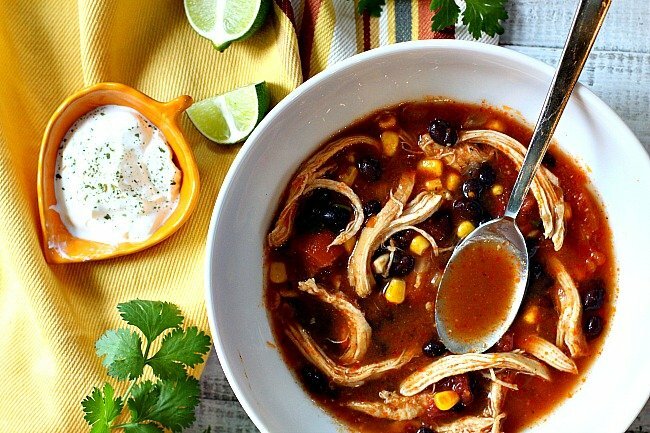 Adding a can of creamed corn gives this chicken tortilla soup a slightly creamy consistency. A can of Original Rotel Diced Tomatoes and Green Chile adds a nice depth of spice. And with just the right combination of Southwestern seasoning, this dish gets rave reviews from friends and family. It just seems like the perfect storm. This creamy chicken tortilla soup recipe calls for both chile powder and chili seasoning. I have a stash of New Mexico Red Chile Powder that I use for about anything. If you don’t have New Mexico Red, use a good quality medium heat red chile powder for this and a good quality Chili Seasoning. Each year, I buy both Hatch Chile and Poblano Peppers from our local chile roaster and pop them in the freezer to use all Winter long. If you don’t have such a luxury, as a local chile roaster, just buy three large poblano peppers for this recipe. Cut off the tops, remove the seeds and veins and chop them. Saute them along with the onions in the Instant Pot. I used two large chicken breasts for this easy chicken tortilla soup recipe. Around one pound each. If you’re using small chicken breasts you may need to lower time. Instant Pot Creamy Chicken Tortilla Soup. A hearty spicy tomato based chicken soup topped tortilla chips and sour cream. A delicious quick easy dinner that you can throw together in a jiff. Rotate the central dial of the Instant Pot to Saute function. When it feels like it's getting hot, add the olive oil. When the oil is hot add the onions and the chopped poblano peppers. 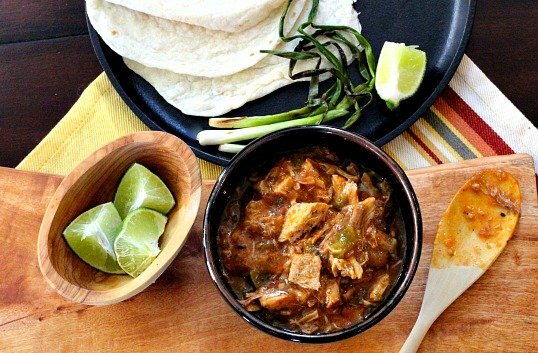 If you're using roasted poblano, wait and add those later with the rest of the ingredients. Sautee until onions are starting to become translucent and peppers are fragrant. Add chopped garlic and heat until fragrant. Hit the cancel button on the Instant Pot to stop cooking. Add remaining ingredients except garnishes. Lay the chicken on top of mixture. Put the lid on the Instant Pot. Make sure the steam release valve is set to seal. Rotate the central dial to the "Pressure Cook" option and press to set. Rotate the central dial again to access the time setting. Set to cook on high pressure for 20 minutes. Quick or natural release. When the pressure has released and you're able to remove the lid to the Instant Pot, remove the chicken to a cutting board. With two forks, quickly shred the chicken. Add the chicken back into the soup mixture, give it a good stir and serve. Ladle soup into soup bowls, top with hand crushed corn chips, a dollop of sour cream, diced avocado and sprinkle with cilantro. Pass diced avocado, tortilla chips, cilantro and sour cream for garnish. This soup will thicken as it sits. Just add more broth when reheating for left overs. The sour cream is not optional. The creamed corn and the combo of stirring in that big dollop of sour cream gives this soup it's creamy nature. The soup looks delicious LA. We have a pressure cooker but just the regular non electric kind – used it the other day to make beef stew. I’ve had a regular pressure cooker for years and it’s never seen the light of day. Isn’t that crazy? Can’t wait to give this a try in my IP!!! Sounds delicious!! Thanks Cauleen. I think the spice level would be ok for the kids. I love my IP and use it 3-5 times a week… chicken, pork chops, soups, steamed potatoes, veggies, hard boiled eggs that peel super easy! I’ve used it for venison and it was great… was afraid the meat would be dry because of so little fat, but it was tender and delicious. One of my favorite recipes is for beans. I use Rancho Gordo beans… and with the IP, there’s no overnight soak! Put everything in the IP on manual for 55 minutes. You can smoosh up the garlic after the beans are cooked. I usually let it go to the keep warm cycle and the natural release. The beans don’t overcook, and are yummy! Sometimes I use two cans of beer, then water to make up the 5-1/2 cups. Karen, I was on someone’s blog a couple of days ago and they mentioned you and your love for the pressure cooker. I really appreciate that bean recipe. I’ll try it. I just cooked ham and beans and the beans weren’t quite done – but ok. I cooked them for 40 minutes. Thanks for this message Karen. Stove top is how I’ve made this for years. And I’ll be anxious to read if and when you get one John. Gosh I am very much like you. Good good cook. Always the go to person for family and friends on cooking baking! Same reservation and thoughts you have had on the IP. But I have not you purchased one yet but getting closer by the day. Would you mind sharing the brand and model # you purchased so I can be sure to include it in my pondering. I really perked up at the saute ability you mentioned. PS: My husband is recovering from a heart attack and quadruple by-pass and I am walking on a cracked hip. Awaiting a total hip replacement. I am thinking this might be a good investment as my abilities my be somewhat limited for awhile. Thanks again. I bought the official Instant Pot brand, the Ultra 6 qt. Let me know if you get one, I’d love to follow along with your IP adventures. Hi Lea Ann, you aren’ t the last to buy an Insta Pot. That would be me! I’ve been wondering how they operate at high altitude. I live above 10,000’. I think there is a pressure difference with altitude. I keep telling myself I don’t need another gadget, but people do rave about them. Happy 2018! You will be happy with a pressure cooker at high altitude. At 10,000 feet it takes forever to cook rice, boil water, get pot roast tender, etc. Contact your county extension service for adjustments for your cooking time. 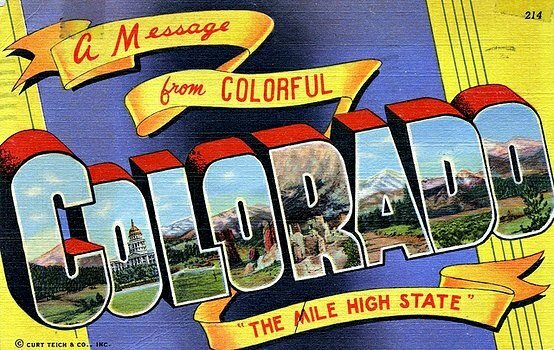 In Denver I had to add a small amount of extra time to my pressure cooking. I made fabulous beef stew and chicken broth, etc. An IP will allow you to sear meats and sweat onions prior to pressure cooking. Just read and understand the safety instructions and beans on your ceiling won’t be a concern! Thank you so much for that information Cheryl. And I appreciate knowing about that increased time. I wondered about that. Beef stew is something I want to make soon. Now that 10,000 ft. part I don’t know about. There’s absolutely got to be some adjusting to think about. So good to hear from you! Happy 2018 to you. The Insant Pot comes with instructions for cooking at high altitude. I am at 3500 feet level which is low enough that I don’t bother. I have the IP 8 quart Duo and use it often and love it. I still use my various slow cooker’s because the IP cooks at a lower temp than most slow cookers. (Read reviews). Beautiful picture of your soup. I’ll try the conventional version. When we moved a couple of years ago, and downsized, I really don’t have space either. I’ll squeeze it in somewhere. 🙂 It’s been fun to have one. I need an instant pot! I have heard so much positive feedback on it! This soup looks and sounds delicious! OK, I’m convinced. I need to look into an IP…my concerns are precisely yours. The biggest being, eeegads, not another ‘thingeee’ to take up space!! Great post! Since we moved and downsized a couple of years ago, that was one of my biggest concerns. One – more – gadget. I’m glad I bought it. I bought mine at Sur la Table in Southglenn – the 6 qt. ultra. Wow, a kitchen remodel! It will be a hassle, but you’ll love it when it’s done. Still do not own this or a crock pot or an air fryer. I am not a gadget person either. However one never knows when the urge will strike. Abbe, we need to go to lunch. I’m going to email you. Interesting information on the instant pot. It does seem to really be the rage now. A friend of mine bought one a few months back and absolutely loves it. Like you, I’m retired, so it’s an appliance that I never thought I would need, but after reading about the clean up advantage, I might have to rethink it. 🙂 Love to cook, but not a fan of cleaning up. Thanks for all of the information and the pros and cons. This soup definitely looks like a pro to me. I love a good tortilla soup and this hits all the right marks. Good old Rotel tomatoes. They add so much flavor! Thank you MJ. I swore I’d never buy one – and here I am. It’s been fun learning to use it. And I do see the advantages. And if it can make Pork adovada as well as what I make on the stove top = I’ll really be singing it’s praises. I have never used an instapot but now I am I curious to try. This soup look great! Lea Ann, that soup looks fantastic! And you are the first person to make me give *serious* thought to the Instant Pot. I’ve been on the fence, lurking, for a couple years. It’s just that I have soooo many appliances and gadgets, I hesitate to get another. Tell me the truth, can I live without it, or am I going to wait till I’m 90 to get one and then be kicking myself for waiting so long?! I could have written the exact same comment – before I bought one. You can definitely live without it, but it sure fun to have. Did that help? First, the soup recipe looks divine. Actually, it looks like the perfect thing to assemble, cook *and* serve at a potluck (since the instant pot allows one to do such things). ~ I didn’t want to like the instant pot, but it became a true necessity living in an RV for two years. I followed some of the rules for using it, but also made a few of my own (using it without the lid to quick simmer/reduce sauces, for example). I use it these days mostly as a slow cooker or rice cooker, but it will be put to heavy use once again in the next few weeks as contractors demolish what’s left of our storm-damaged kitchen so that it can be (finally) rebuilt. ~ Excellent review! Thank you! Hi Adam. I didn’t want to like it either. But it’s sure been fun to have. I didn’t think about it’s use when kitchens aren’t available. I’ll sure look forward to the day when I hear your life is back to normal. I have used pressure cooker but I havent seen this pot here in Copenhagen yet. Love your soup. I bought an IP on black Friday, knowing my kitchen would be out of commission during our remodel. Today was the 3rd time I used it—to cook a whole chicken so I’d have some meat for quesadillas. Bonus was lots of chicken broth. And enchiladas later this week. Your tortilla soup looks wonderful—I’m starting to collect recipes!! thanks for the insite on this pot. I really love this soup not so much something else I want to clean .. I am going to make this one on top of the stove. I still have an air fryer sitting on the floor no space to store it and not used lol I am also retired. Terrific photos of this soup! love it! I can’t wait to try making this! I’ve been on quite the hunt lately for new Instant Pot recipes and this one looks fabulous! Absolutely love that this includes roasted poblanos…talk about delicious! Wow this soup looks delicious and so comforting. I can’t wait to try it when it’s a little colder around here for dinner – I’m sure my spouse will love it too! I’m still so behind with trying instant pot! After seeing this terrific dish, I think I may just order one today! Love the combination of flavours in this soup!